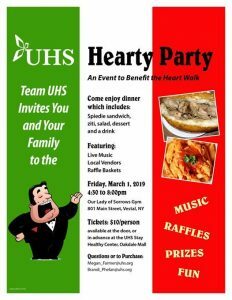 The Annual UHS Hearty Party is scheduled for Friday, March 1, 2019 from 4:30 pm – 8:00 pm. The event, which benefits the American Heart Association, will be held at Our Lady of Sorrows Gym on Main Street in Vestal, NY. Tickets are $10 per person and include a Spiedie sandwich, ziti, salad, dessert, and beverages. New for 2019 is the addition of the always enjoyable Kitchen Sink Band playing a mix of familiar songs from such artists as the Tedeschi Trucks Band, Tom Petty, The Allman Brothers Band, The Grateful Dead, Little Feat, Talking Heads, the Zac Brown Band, the Marshall Tucker Band, as well as many other favorites. Tickets can be purchased by contacting Brandi Phelan at 607-762-2260 brandi.phelan@nyuhs.org or Megan Farmer at 607-763-6722 megan.farmer@nyuhs.org. In addition, tickets are available for purchase at the UHS Stay Healthy Center at the Oakdale Mall as well as at the event. A VIP ticket option is also available and can be purchased through Megan or Brandi. VIP packages consist of 1 dinner ticket and 25 drawing basket tickets for $25 or 2 dinner tickets and 50 drawing basket tickets for $45. Among the themed baskets to be offered in the drawing are: crafts, snacks, movie night, beach toys, date night, kitchen, lottery, fitness and many more. The UHS Hearty Party and basket drawing are just some of the many ways Team UHS is raising funds to benefit the American Heart Association.